Hello friends! How did the weekend go? I've been a bit absent from my blog lately as we've been busy and because I'm having some computer issues. Hopefully that will be fixed soon! 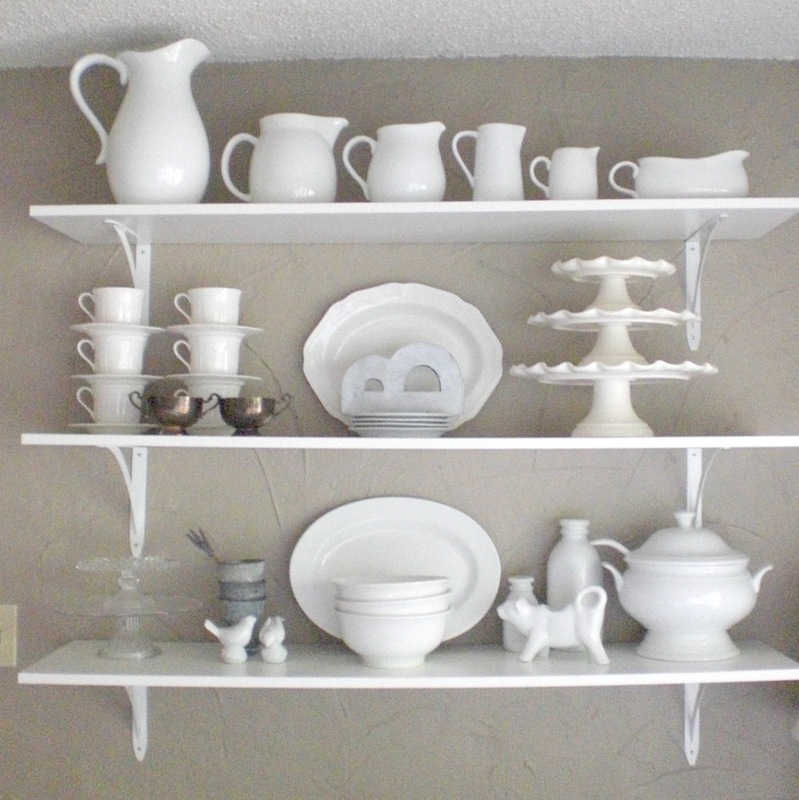 Today I wanted to show you the shelves my sweet father-in-law was kind enough to install in our kitchen. 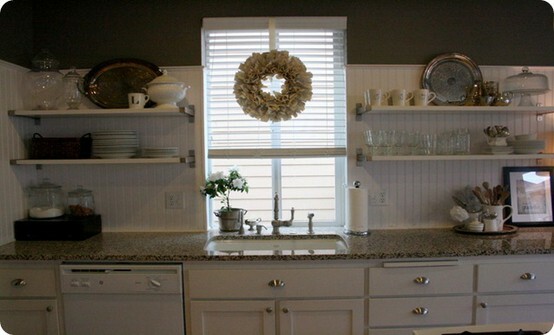 Our kitchen is not big, but does have plenty of storage space. 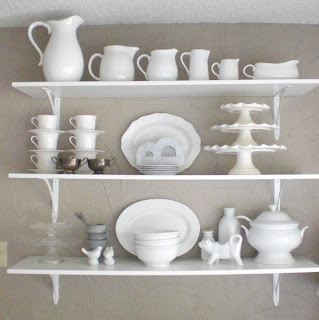 But when you get married you get A LOT of kitchen items : ) So we still needed some extra storage to display our serveware/china. I simply went to Lowe's and purchased pre-made shelving and brackets. We aren't too "home handy" yet, so we had Matt's dad come over and install the shelves (hopefully we can learn to be handy homeowners soon...I'm sure it's a process!). 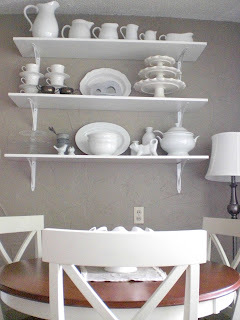 The installation was no small task as our home was built in 1910 and the wall is some strange concoction of plaster, dry wall and plywood, with studs which may or may not have been in the right place. 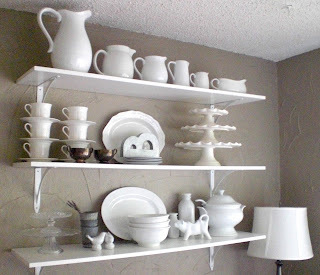 It took him 6 or 7 hours to get thse simple shelves up because of the wonky wall, and I'm forever grateful for the time, energy and care he put into installing them! I love having this floor lamp in the corner of the kitchen. It adds so much extra light and make the room feel much more cozy. My antique Belgian pitch pots are from Zinnia Cottage on etsy. 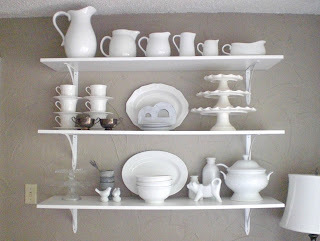 I couldn't resist this old cream and sugar set at the thrift store for just 95 cents. 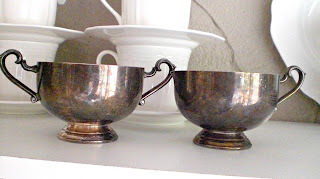 I love the patina of the tarnished silver against the white. Can you tell that only one of these pitchers is old? It's the second one from the left. The rest were wedding gifts from Target or Bed Bath and Beyond. 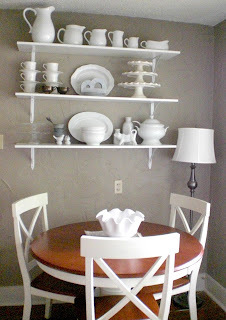 I'm so happy with our little dining set from Target.com. Remember when I purcahsed it here? 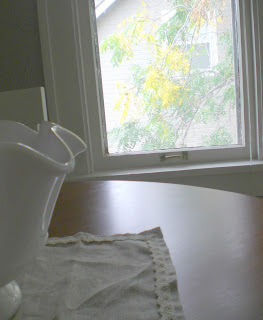 I couldn't resist capturing the first bit of fall outside our window. 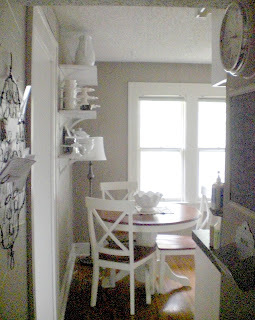 This is the view walking into the kitchen from the living room. The windows make everything so bright, which is wonderful in a small space. I've made the pass through our "command central" with a mail slot, chalkboard for notes/lists, and a wire memo board to hold papers, bills, invites etc. In a small space you have to think outside the box and this is our solution to a home office. Below are several inspiration pictures I'm pulling from for the look I'm going for. I know I haven't achieved it yet, but it'll get there! 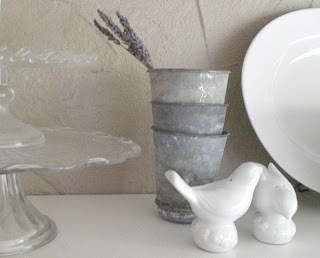 I love the vintage feel this has, with the mixed elements of wicker, marble, tarnished silver and glass. What do you think girls? What would you add? Take away? I'd love to hear your feedback! As always, thanks so much for stopping by. I can't tell you how much I appreciate each and every one of you who takes the time to visit my little piece of the blogosphere! 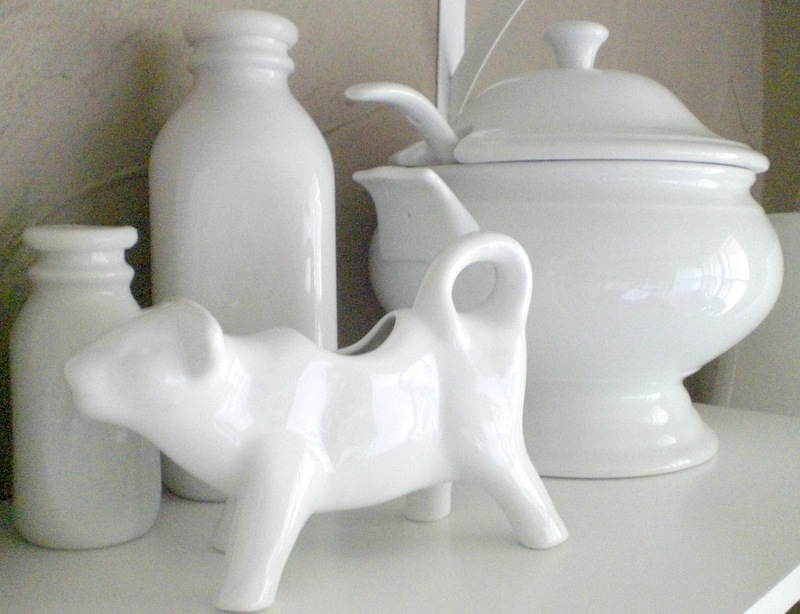 I'm linking to Tuesday's Treasures at My Uncommon Slice of Suburbia, Good Life Wednesdays at A Beach Cottage and Farmhouse Fridays at Laurie Anna's. Pure white and looks exorcist. This floor lamp in the corner of the kitchen is great. It adds so much extra light and make the room feel much more cozy. 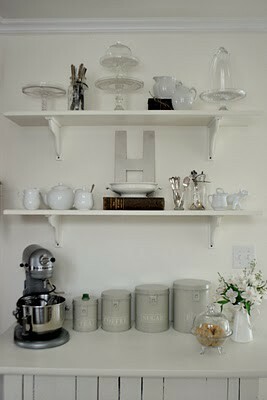 The white shelves with all white china, in our my kitchen, prove I am a fan of the look. Good luck on standing up the B.
I kind of like the B on it's side - interesting! 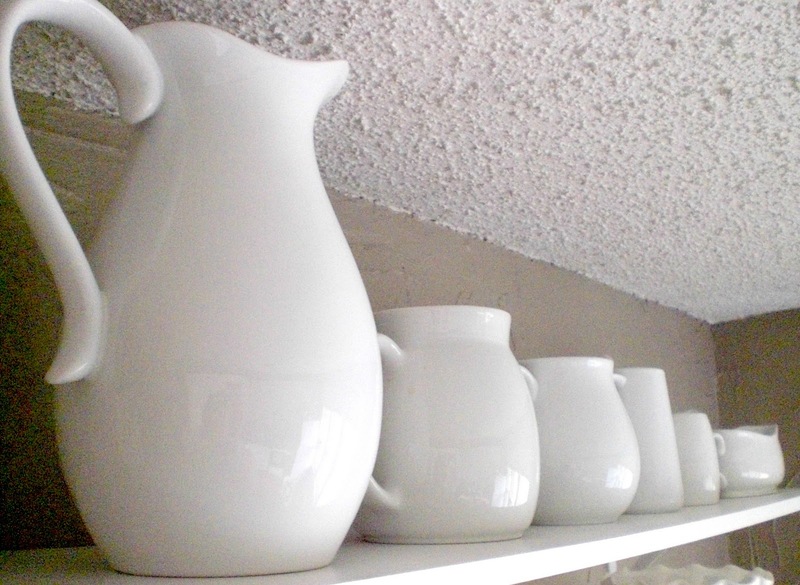 Your white shelves look great, I love the jugs! what a tranquil, lovely space you're creating! Lovely space you have! The shelves turned out great. Thanks so much for stopping by and adding your link to Beach Cottage Good Life Wednesdays. 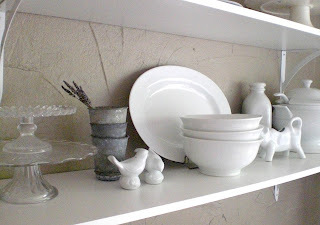 Hi Courtney ~ Your shelves look great just as they are but the best part is being able to change things up from time to time or adding your latest newfound treasure. Have fun!! 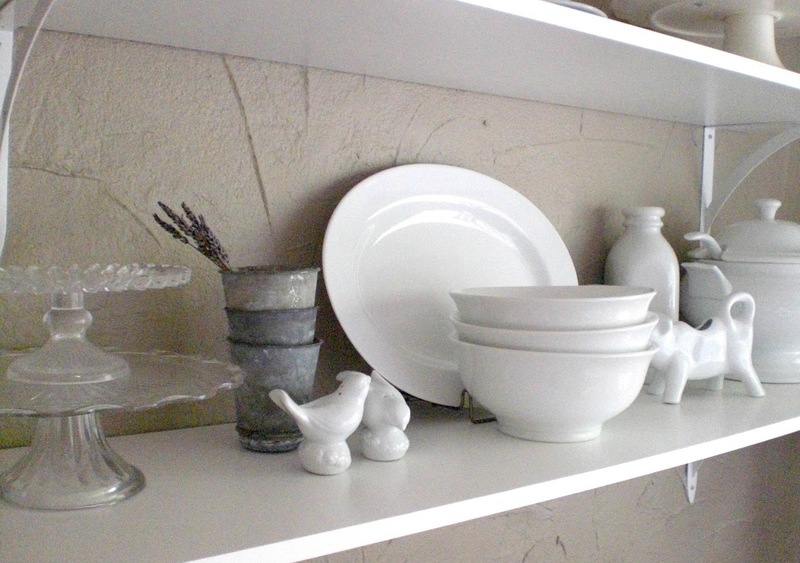 Lovey whites! The shelves make that spot beautiful with all your lovely china. Great decorating! What a lovely collection of white! 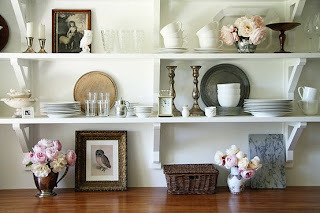 And I agree, a lamp in a kitchen or dining area (any room actually)provides such a cozy feel to the room.